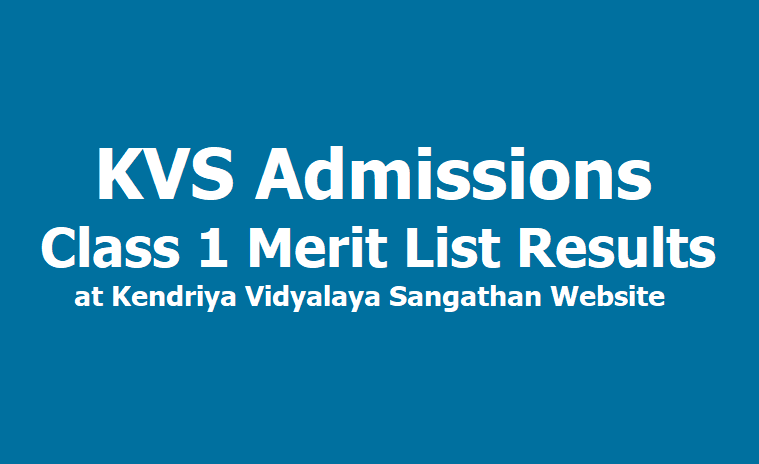 KVS admission 2019 First Merit List Results. KVS admissions 2019 Class 1 First Merit List Results at kvsonlineadmission.in: The Kendriya Vidyalaya Sangathan (KVS) will release the first list of provisionally selected candidates for admission to class 1. The list will be declared at the official website, https://kvsangathan.nic.in/ or kvsadmissiononline.in. Subsequently, the second and third list will be published on April 9 and April 23, 2019. The lists will be released based on the availability of seats, no additional lists will be released if all applicants join the institute. The online registration process for admission to class 1 in Kendriya Vidyalaya schools for the session 2019-20 has begun since March 19, 2019. The registration for class 2 and above (except class 11) will begin from April 2 at 8 am and will conclude on April 9 at 4 pm. For class 11, application forms will be issued in offline mode after CBSE class 10 result is declared. This year, the CBSE has announced to declare the class 10 result early. Reportedly, it can be declared around May 10, 2019.The admission will start within 10 days after the KVS declares the shortlisted candidates’ list. A total number of 6,48,941 candidates applied for around 1 lakh seats.. The list can be seen on the official website of the individual schools. There is a total of 1,137 Kendriya Vidalayas across the country. The students will be shortlisted as per the priority category. - First List: The Kendriya Vidyalaya Sangathan (KVS) to release the first list of provisionally selected candidates for admission to Class 1 on March 26, 2019. - Second List: After the first list, the second and third list will be published on April 9 and April 23, 2019 respectively. KVS admissions 2019 Class 1 Second Merit List Results released at kvsonlineadmission.in: The Kendriya Vidyalayas has released the Second KV admission list for Class 1 on April 9, 2019 on the official websites of respective KVs. The Kendriya Vidyalaya Sangathan (KVS) had released first merit list for Class 1 admissions on March 26, 2019. The last date to submit online application for admission in Class 1 was March 19, 2019. The KVS will release the list of children registered, list of eligible children, category wise list of provisionally selected children on the official website of the concerned school and same will be displayed on the School's Notice Board. KVS has concluded Class I admission process just a few days ago. Approximately 7-8 lakh applicants had applied for 1 lakh Kendriya Vidyalaya seats in the country. The reservation of seats will be as per KVS Admission Guidelines available on the website. Step 1) Log on to the official website of KV for which you applied. Step 2) Click on the link of second admission list, given there on the homepage. Step 4) With the help of Control and F key search candidate's name in the merit list. Total number of 6,48,941 candidates have applied for around one lakh seats to secure a seat in 1,137 Kendriya Vidalayas across the country. The parents who applied for their kid's admission in KVS can visit the official website of the KVS to find out more details and check other latest update on the list.